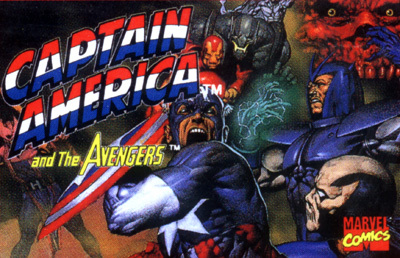 Captain America and the Avengers is the title of a beat 'em up coin-op arcade game released by Data East in 1991. Data East originally released a home version of the game for the Sega Genesis. The game was later licensed to Mindscape, who released their own less-than-perfect ports of the arcade game for the Super NES, Game Boy and Game Gear. Gameplay is similar in format to the Teenage Mutant Ninja Turtles arcade games, as well as other beat 'em up arcades developed by Konami. Each character can attack and jump, and also pick up and throw certain objects positioned in each level, i.e. bricks or barrels. Attacks are accompanied by comic book-style sound effect words such as "THWAK!," "WHAM!," "KABOOM!," "KRAK!," etc. Each character also has a special projectile attack, and the ability to block certain shots.